The significant changes in coagulation status during chroniodialysis, performed in patients with secondary hyperparathyroidism require completion of meticulous surgical hemostasis in order to prevent active bleeding in the postoperative period. Aim: To present our experience with harmonic scalpel application in the surgical treatment of secondary hyperparathyroidism. Patients and Methods: 112 patients with secondary hyperparathyroidism (77 males and 35 females, aged from 23 to 60 years) have been operated on in our institution for 10 years period. All patients were on chroniodialysis. Hemostasis was achieved using conventional instruments and electrocautery in 46 patients and in 66 patients harmonic scalpel of Ethicon EndoSurgeryCare has been used. All patients had serum levels of parathormone above 2500ng/l. Ultrasonic examination revealed at least 2 parathyroid glands larger than 10mm in all cases. The amount of blood loss, necessity and type of drainages used, frequency of postoperative complications, postoperative hospital stay were comparatively evaluated. Results: In 12 patients parathyroidectomy with autotransplantation was carried out, in 62 patients subtotal parathyroidectomy was performed. In the rest 35 cases- three of the parathyroid glands were removed (because of the impossibility to identify the fourth parathyroid gland, using ultrasonic and intraoperative methods). All patients were proven to have a sharp decrease in parathormone and Calcium serum levels. In the group of patients, where conventional instruments and electrocautery for hemostasis have been used, corrugated and tube drainages were applied as a rule. For the patients, in whom hemostasis was performed using a harmonic scalpel, simple glove drainages were used. In all patients in the pre-operative and post-operative period serial hemodialysis was done with LMW heparin administration. Significantly lower blood loss from the surgical wound was found in the group, where harmonic scission was used. Conclusions: We consider that the application of harmonic scalpel in the surgical treatment of patients with secondary hyperparathyroidism on chroniodialysis leads to safer hemostasis, lower postoperative complications rate and thus shortens the postoperative hospital stay. Key words: secondary hyperparathyroidism, harmonic scalpel, surgery, auto transplantation. Nenkov R, Radev R, Marinova E, Cvetkov N, Semkov A, Petrov B. HARMONIC SCALPEL POSSIBILITIES IN THE SURGICAL TREATMENT OF SECONDARY HYPERPARATHYROIDISM. J of IMAB. 2013; 19(1):412-415. 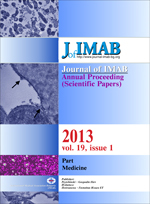 DOI: 10.5272/jimab.2013191.412.